Most of you moms are getting ready for your kids to go back to school. You’re going through your checklist of school supplies, trying to figure out what to you need to buy and what can be re-used. My kids started school this week, so I got off to an early start. Luckily, I didn’t have to buy a new lunch box or lunch containers, as I had an ample supply from previous years. Both of my kids’ schools encourage kids to pack a waste-free lunch as well as snack. It’s California, go figure. I’ve had a few years to perfect the art of packing a waste-free lunch, so I thought I would share with you some of my favorite items and as well as some tips. Above is a typical lunch I pack for the kids, it has a fruit, entree and beverage. I like to pack the kids’ lunch in glass containers, because they are the best and safest containers to eat from. No BPA worries with glass, plus with glass you taste the actual food. Glass doesn’t leach a metallic or plastic taste, as with plastic and metal containers. The best thing about glass is that it’s dishwasher safe, and can be re-used again and again. For those of you that are worried about using glass, I get it, but I wanted to let you know that Eli who is almost 8, has been using these containers in his lunch since pre-school, and has yet to break one. He is all boy, so that’s saying a lot. You don’t have to go out and buy new containers. Take a look in your cabinets, and see what you have on hand already, and get creative. 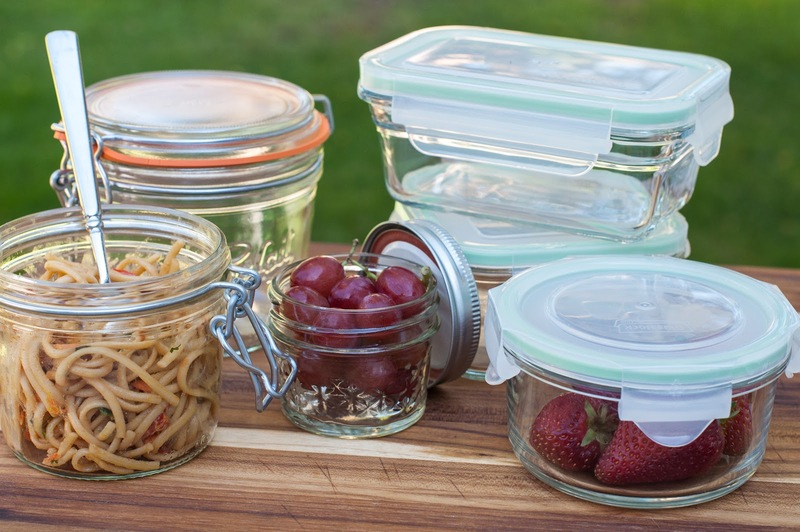 If you need to purchase some new containers, hit the Container Store or Bed Bath and Beyond, as they both have a great selection. 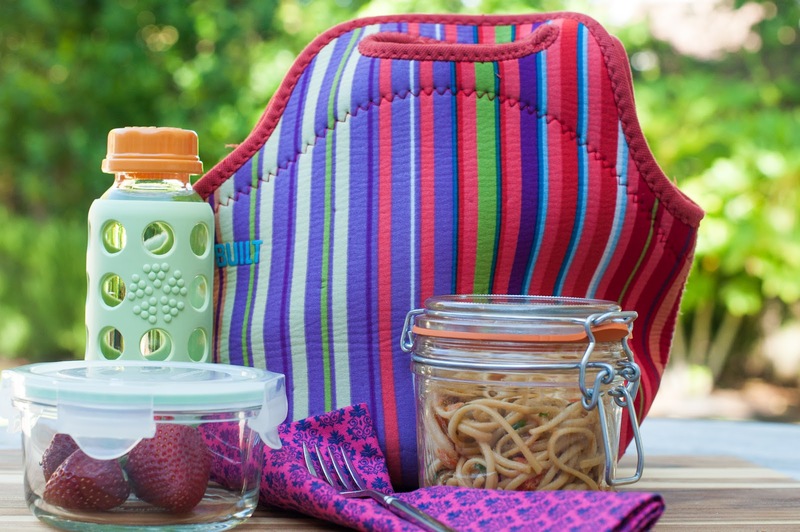 I absolutely love these lunch bags from Built . I have one for both Zoe and Eli, (John has one as well) and have had them for 5 years. They totally last! The best part about them is that they are machine washable. Yes, you heard me right; they can be washed every week! How great is that? I love the cleanliness of these lunch bags, and the fact that they are made from neoprene, so they keep the glass safe. You can get them in all shapes, sizes and colors. Check them out! 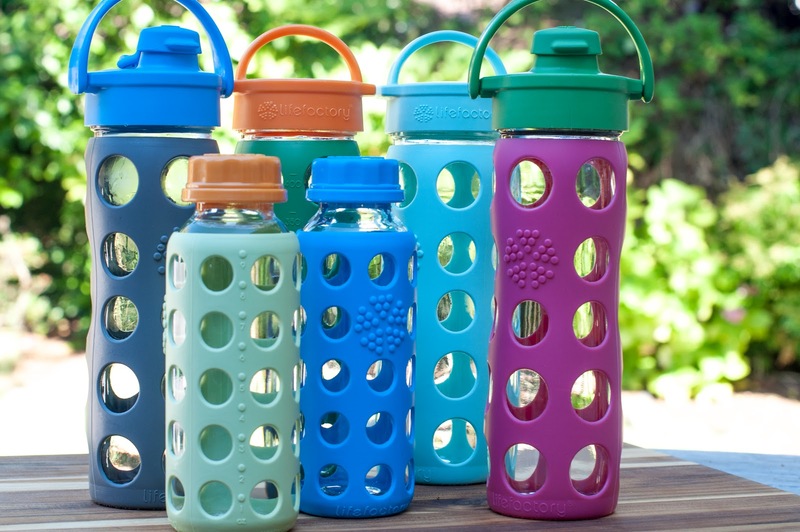 The other product that I absolutely love and couldn’t live without, are these glass water bottles from Lifefactory. I honestly have about 20 of them in my cupboard ranging from the 9oz and 16oz (shown below) to the 22oz. These are the best bottles to drink from. I mean do you drink from plastic or metal at home, probably not, then why would you want to drink from plastic or metal on-the-go when you can drink from glass? Makes sense, right? The entire bottle and cap can be cleaned in the dishwasher. Your water or beverage will taste the way it’s supposed to taste, and not have a plastic or metal aftertaste. 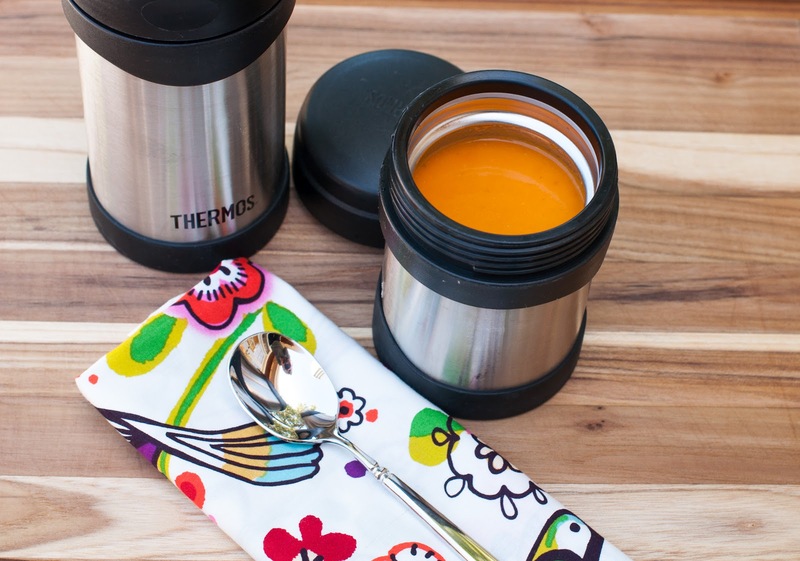 I use the 9oz bottles for the kids’ lunch as they fit perfectly into any lunch box, and the 16oz is what my kids take to school to drink throughout the day. Eli likes to use the flip cap top at his desk for easy access, and Zoe prefers the twist cap to keep in her locker. We also use these bottles at all sporting events, well, basically everywhere. When I’m packing the kids’ a hot entree, (usually leftover pastas, soups and various entrees) I use theseThermos stainless steel containers. I just heat up some water in the tea kettle, pour it into the thermos, twist on the cap, and let it sit anywhere between 5 and 15 minutes to warm up the container. When I have heated up the entree, I empty out the hot water, dry the container, and then put in the leftovers. The leftovers always stay warm till lunch-time. Now that’s what you call a “hot lunch.” You don’t need to go out and buy and fancy napkins or special silverware, just use what you already have. 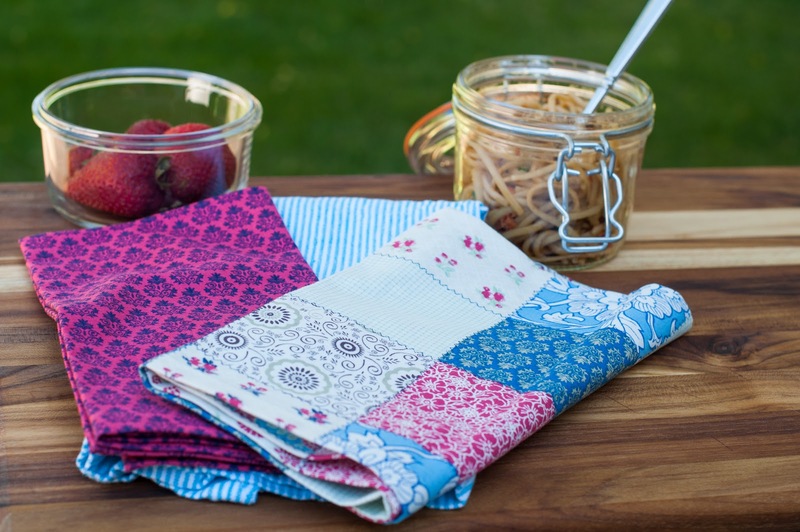 I have tons of cloth napkins that I have picked up over the years, so I just throw in whatever I pull out of the drawer. I also use our everyday silverware for both the kids’ lunches and snacks. 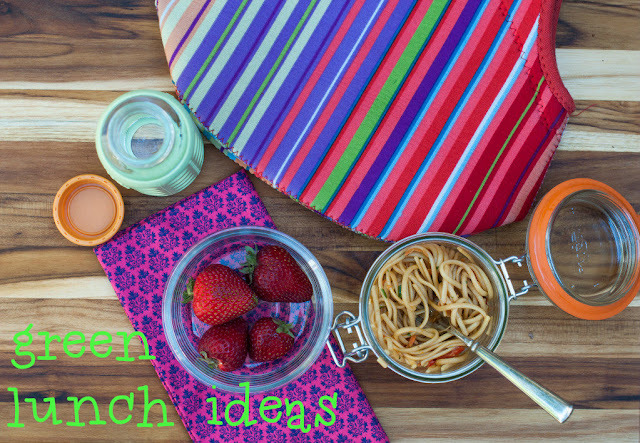 When it comes to snacks, I try and use re-usable containers as well. I love both of these snack bags from Snack Taxi and Resnackit. 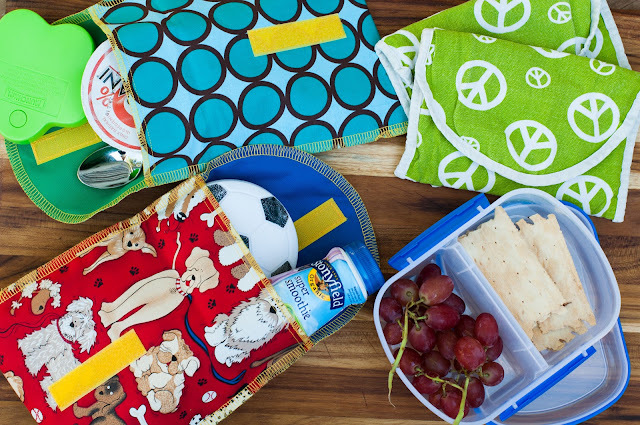 They’re both machine washable, so if you pack a messy snack inside like banana bread, it will clean right up. If I pack a snack that needs to be kept cool, like a cheese stick or yogurt, then I will throw an ice-pack in there. I also love these BPA free plastic containers from Klip-It. They work for those fragile snacks such as popcorn, crackers etc. All of these ideas may set your wallet back a few dollars, but they will pay for themselves in time, as these products last and can be used year after year. When you add it all up over time, you will actually be saving money while saving the earth at the same time. You may also have to throw a few more items in the laundry as well as the dishwasher, but you’ll get use to it and you’ll feel really good about the positive impact your making. You’re teaching your kids the value of recycling and re-using items in your home, as well as creating less waste. It’s virtually a win win for your family and the earth. Do you have any ideas, tips or suggestions that you would like to share? Questions? If so, comment below, I would love to hear from you! This container is very useful. Now our children have no needed to throw their insightful material anywhere because of this container. I am loving all these snacks- for the kids and myself:) I must get me one of those bottles! You have to grab one of these bottles. They are the BEST, and you will not regret it. Check out your local Whole Foods. Thanks Becca! I cringe thinking about how it used to be when we grew up, and sadly it’s that way in most states still. Those snack packs are next om my must-buy list! They are the best and so easy to clean up! Jackie, I so appreciate your taking the time to do this post and show people environmentally friendly lunch materials. I hope lots of people read this and take it to heart. Thanks so much Sharyn. I hope people read it as well and get some helpful tips.